We’d love your help. 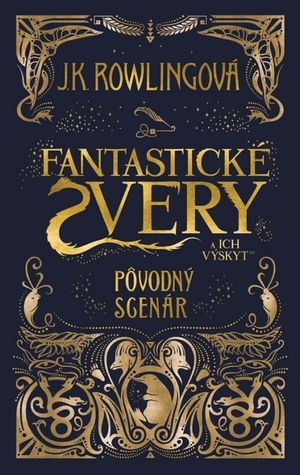 Let us know what’s wrong with this preview of Fantastické zvery a ich výskyt by J.K. Rowling. 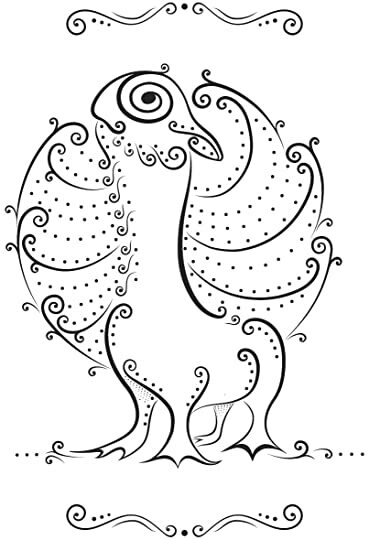 To ask other readers questions about Fantastické zvery a ich výskyt, please sign up. So is it just the script with a cover? Cady It most likely is, I mean seriously it's called a "screenplay"
Will there be a novelization of the movies or just a script published? Lisa This is just the screenplay. It's a bit more than just a scrip. It comes a bit closer to being an actual book than the cursed child was. There is also…moreThis is just the screenplay. It's a bit more than just a scrip. It comes a bit closer to being an actual book than the cursed child was. 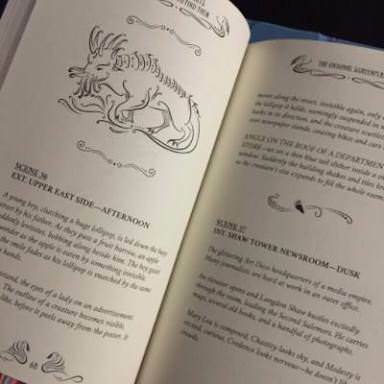 There is also the little textbook from the hogwarts library that also called fantastic beast and where to find them .It's a really cute book. Written by the Queen of Magic, expanding the Huge World she created, that's hidden among us. With its Fantastic Beasts.. and Where to Find Them. “they’re currently in alien terrain, surrounded by millions of the most vicious creatures on the planet. The Story “the Plot of the Movie” is a bit simple, even more than Harry Potter's first book. 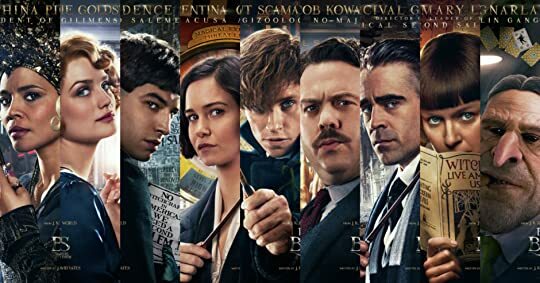 I was expecting some Prisoner of Azkaban mystery and multi-layers twists.. but here is way simpler plot.. Rich World, yes..but not strong plot. Don't get me wrong, I LOVED IT, It's more mature, adult characters now in the leading role, huger world.. and it's still rich enough and entertaining. But the more I think of it, it felt like mostly grabbed its richness of the World we already know, and the history of it which we already get a glimpse before. Yet, it is here more detailed and it's still amazingly "Fantastically" entertaining and magical in itself. Stretching the Wizarding World History both in location and Time..
New York, the 1920s, after the Great War, in the fast changing city, with its new inventions, the prohibited gigglewaters, speakeasy raids..
And where even the Magical Laws of secrecy in its worst, not even allowing to befriend the No-Maj .. and the No-Maj suspicious and hater of Wizarding World at its peak. All Because of one Notorious Dark Wizard who terrorizing the both worlds..and has as much followers around the world who just helping his cause.. But since he's mostly -may be- not a major here, let's focus on Newt Scamander and the rest of.. He's this young Magizoologist, the Fantastic Beasts Nerd, comes from England to New York for a certain Beasts-Related mission... in New York where they have no tolerance for Magical "Fantastic" Beasts allowed, they even can kill them to rid of them once and for all.. I just adore how he's so "dorky" in a way, his love for his beasts really remarkable. I’ve just completed a year in the field. 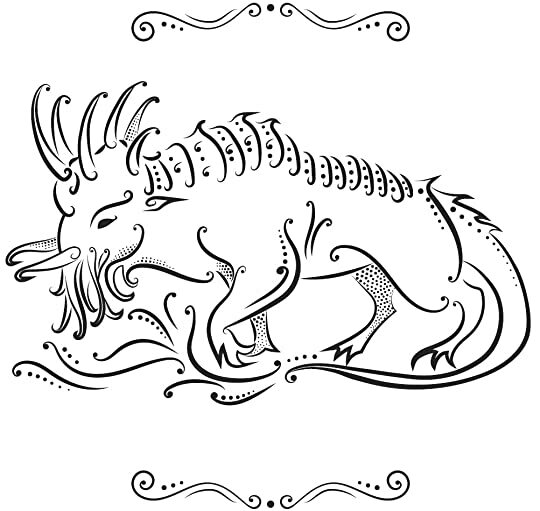 I’m writing a book about magical creatures. But his insignificant misfortune encounter with a very funny, average poor Muggle No-Maj sets a Huge trouble. Did I tell you that Wizarding world in America doesn't at all collaborations with No-Maj? But come on, you can't easily have enough of this very fun man. and so glad that the story involve a Muggle in a big role this time. And there's this misfortune Auror, Tina who tries to investigate his mysterious Case of Beasts. But find herself and her extraordinary beautiful charming mind reader sister Queenie getting involved into this huge mess. Finding the Fantastic Beasts.. Okay, she's my best character here... I love her so much, and The whole movie I been wondering -will they stay together till the end of series? specially Queenie and Jacob "the no-maj" - which heavily reminded me with Strike and Robin relation in a way. I mean, it's like He is her Fantastic Beast in a way, and so She is his Fantastic Beast too. All that while in the background, the hatred between some Witch hunters ..Those who hate the others just because they're different..
..those who beside that felt oppressed, hated and looked at lowly..
and those who save the law by looking for dark powers.. ..Dark powers that rising in a dangerous deathly political game effects both our World and the Wizarding World. It's diversity of characters, with depth analysis of evil nature, prejudices, oppression and locking oneself in a closet while forcing others do as well..
And, my God can't say more.. the characters are awesome, more than awesome. Rowling really mastering that. It's not the first time to read a Screenplay, yet it's the first time to read it in this elegant book format..
Clear, with fine arts sometimes, perfect spacing..
and even the little extra describing of the story.. I know it's not like reading a novel... it's just a different experience. And of course because we all want every story of the Wizarding World in the forum of a book. Yet I felt bit disappointed that I needed to read the Deleted Scenes including in the script.. but the book only hold the original film script. So yeah, go Watch the movie, and Read the Screenplay as well. The Screenplay is Fantastic, magically written, even if I see the story simple this first round, -I'm sure that'd change later- yet reading it now... just wow, marvelous. Rich World, Rich Characters, good -not huge or great- Conflict, and Fantastically paced for me. The thing here is that, unlike Harry Potter movies. Where its original stories suffer injustice simplification in the process of foreign screenwriters. This time the story fit and complete. this time it's totally J.K.Rowling, the best who can write about this magical world..
And the same those who made the Potter series Magical Cinematic experience visually, they're here too to make this series Fantastic Cinematic too. Thanks A Million for Amazon.co.uk for sending the book in Priority Shipping,though I didn't pay for that. Thank you. And remember, it's the first part of the 5 parts Prequel to the Saga of the Boy Who Lived. This is not actually a "book" so I can't really write a review about it but I'll say a few words. Apart from the looks, this is a screenplay. It's exactly what the movie is. I'm a Harry Potter fanatic, fangirl, geek, nerd, I breath it, it's me, YES I AM HARRY POTTER and I always try to CONSUME anything concerning it. So, naturally, I have watched the FBAWTFT movie many times. Naturally. Along with the lines and descriptions of the book I could picture the scenes in my head perfectly. Not because I have watched the movie many times, oh no, because the book was good at describing them, obviously. Obviously. I also adored how we got to see some more hidden thoughts from the characters (THE SHIPS GUYS THE SHIPS) and some more details from the movie. Furthermore, it contained some deleted scenes I didn't expect to see. Nice touch there. I finally read this! I mean, I've seen it twice (so far) and the script is exactly the same as the film (minus the actors, effects, pictures, etc. ), but I 100% enjoyed the experience. It is just amazing to dive into this old/new world, too feel all those feelings again, to fall in love with its characters, to be able to see and know more. Especially after the disappointment of the Cursed Child (where the script sucked, but the play was mindblowing). I can not wait to see the other 4 films. 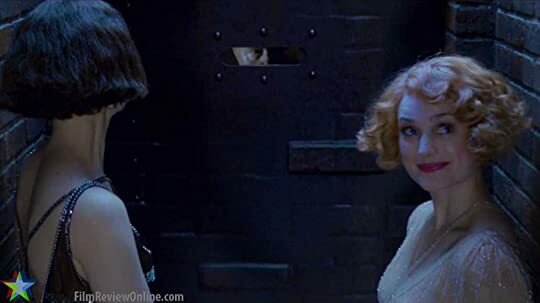 I really hope to see Queenie again, she is my new Hermione Granger and Alison Sudol does the most amazing job portraying her. Tina is cute and throughout the film I liked her more and more, but I wasn't overly satisfyed with Katherine Waterston's acting. Johnny Depp. Well. I have concerns here. 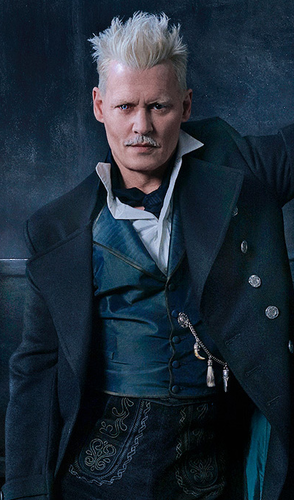 We didn't see much of him of course, but I'm scared that he'll make Grindelwald look ridiculous. I'm not a fan of him as an actor anyway. I think he is too much of a personality, too much Johnny Depp, to just see him as the character he is playing. I just saw it again and by Merlin's Beard I'm so in love with JKR. Queen of fantasy. After the travesty known as Harry Potter and The Cursed Child, I really needed this adventure. The Cursed Child is all so very serious. Granted, Harry’s life has some pretty dark moments, though it always foregrounded by this idea of friendship and love. The Cursed child just felt depressing. This carries with it all the whimsical humour of the earlier Harry Potter books before things became dark and se After the travesty known as Harry Potter and The Cursed Child, I really needed this adventure. The Cursed Child is all so very serious. Granted, Harry’s life has some pretty dark moments, though it always foregrounded by this idea of friendship and love. The Cursed child just felt depressing. This carries with it all the whimsical humour of the earlier Harry Potter books before things became dark and serious. 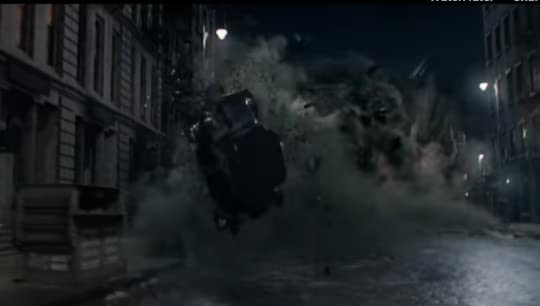 The plot relayed all the clumsiness members of the wizarding world seem to possess. It made me laugh. 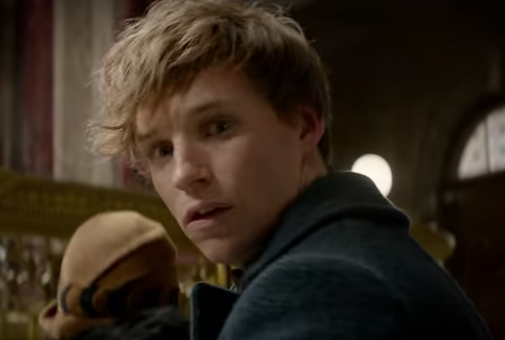 Newt Scamander feels like he belongs in this world. He has all the characteristics of the Hufflepuff house, such as dedication and loyalty which are shown in his devotion to his animals. This seems like an obvious things to say, but when considering the fact that half the characters in The Cursed Child felt out of place, it becomes a necessity. He’s also played by one of my favourite actors in the movie; he seems like a perfect cast for the role. This could exist on its own. It's a new story in the normal world. If you’re one of those strange people who have not yet read or watched the Harry Potter series, you’d still easily enjoy this. It does draw on some aspects of the already established universe, but not so much that they define the plot. This felt independent and new. Returning readers will also enjoy the references, but at the same time still be able to enjoy its separateness. So this was rather good even in this form. It would have been nice to see it novelised but I suppose the movie is the real thing in question, this is just a fortunate by-product. I loved this so much <3 And the book itself was one big work of art! Any word on if the next movie scripts will be released as a book as well? The hardcover is a bit on the expensive side, but Book Depository has it going for 50% off right now in some countries! 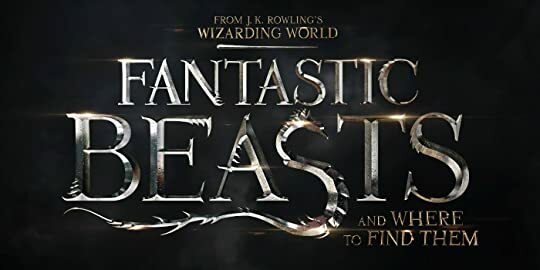 This is the screenplay of the film of the same title, don’t confuse with the previously published reference book sharing the same title, and also by J.K. Rowling. If I am dreaming, please don’t wake me! 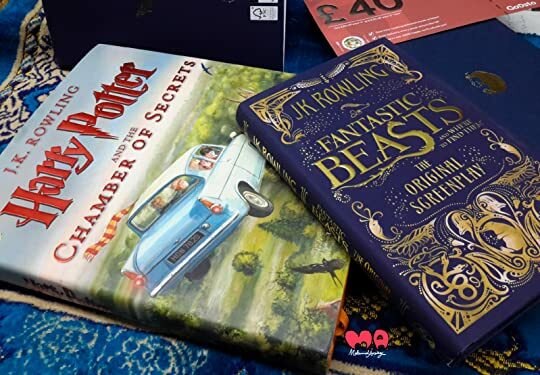 Two new books by J.K. Rowling (this one and Harry Potter and the Cursed Child) plus three digital short stories, expanding the Wizarding World of Harry Potter in the same year! Oh, yeah! Wicked! I couldn’t ask for something better! 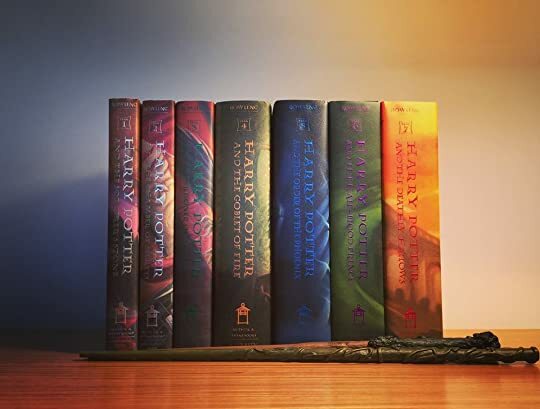 …and I guess that it was something to be happen, sooner or later, but reading in the web about the intentions of using Paris as the next location in this new prequel series, it seems that Harry Potter Magical Universe isn’t only coming to USA, but it will reach eventually the whole world! 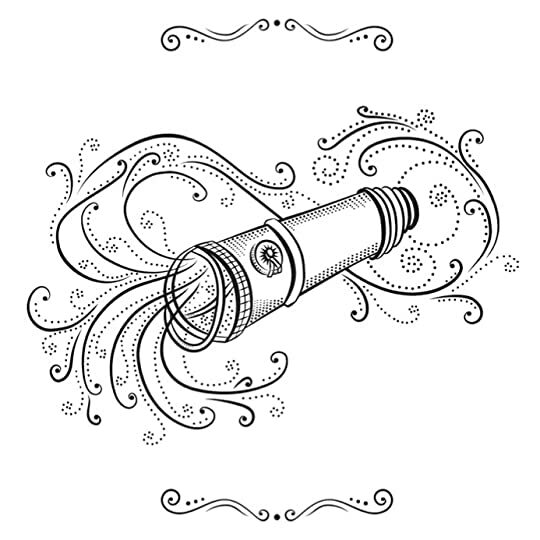 …set in 1926, about 70 years before the beginning of the events of the original Harry Potter literary saga. …but there is a secret darkness already in New York, an evil force looking for a powerful being to weaponize it against the whole wizarding community! …a muggle!!! Sorry, a No-Maj (well, at least that’s how the American wizards call to the non-magical people there). …Jacob Kowalski, potential baker! Oh, yeah! 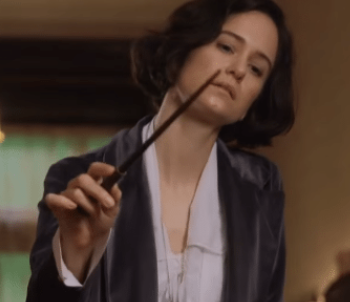 About the witch sisters, the Goldstein sisters, Porpentina aka “Tina”, demoted Auror in MACUSA (Magical Congress of the United States of America), and Queenie, who is a Legilimens (a witch able to read minds). …and nobody will be safe, wizards and mug…mmh…no-majs alike! The Wizarding World of J.K. Rowling just got larger! And we are only just beginning! Newt is obviously meant to be my husband and I'm kind of obsessed with him and everything about this movie/screenplay. I slept on it. I didn't want to write my review right away because I wanted to see if my feelings would calm down. And they did. A little. Otherwise I still feel a longing for more, some kind of happy sadness (yes, I've gone completely insane). About 15 minutes after finishing the screenplay, still struggling to control myself, I went to my husband and told him that I really need a physical copy. And not only do I need it, but I want it. And it has to be in English because I don't want any alteri I slept on it. I didn't want to write my review right away because I wanted to see if my feelings would calm down. And they did. A little. Otherwise I still feel a longing for more, some kind of happy sadness (yes, I've gone completely insane). About 15 minutes after finishing the screenplay, still struggling to control myself, I went to my husband and told him that I really need a physical copy. And not only do I need it, but I want it. And it has to be in English because I don't want any altering to it. I strongly recommend that you see the movie first. If by some chance you don't like it (what's wrong with you? ), you're not going to like this either. Reading the screenplay feels like rewatching the film in slow motion (because of my reading speed). Also, the cinematic version has exquisite effects that will definitely improve on your imagination. The beast are both adorable and majestic. 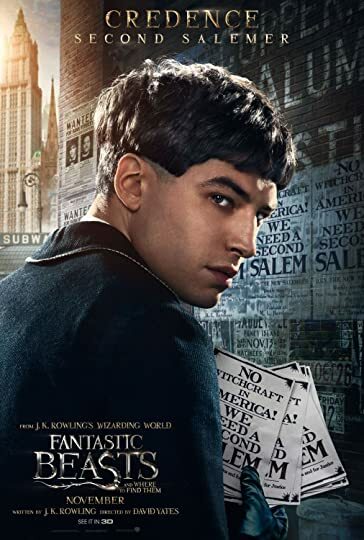 I saw some reviews of people disappointed that this was not a Harry Potter movie. And to that I am speechless. There is no HP in the title and the plot is set way before he was born. So I don't see a connection. What I do see is an amazing movie (with a wonderful screenplay) that stands on its own. Take away all you know about HP and this is still a great movie. My absolute favorite character is Jacob, the No-Maj (or Muggle, if you prefer). He's the comic relief, but he's more than a silly character. He's got courage and compassion, and I'm proud that our kind got him depicting us. Jacob brought tears to my eyes, and I love him dearly. So, to sum up, go see the movie and get the screenplay. They are both worth it. 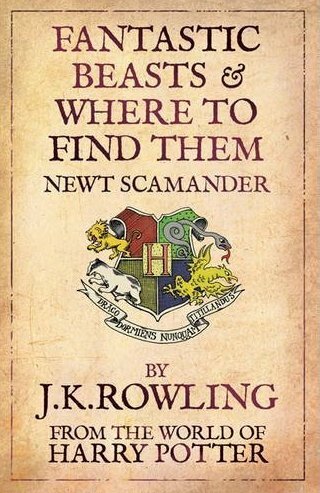 ✔ Read Newt Scamander's book. "Because I like you. Because you’re my friend and I’ll never forget how you helped me, Jacob." 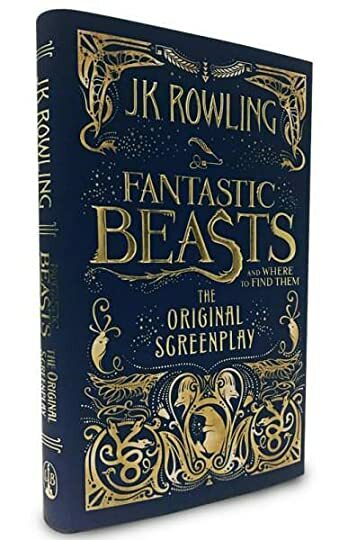 First of all, I really loved the design of this book, especially when you just finished those chapters and saw the pictures of each fantastic beast. I couldn't stop myself from rubbing the cover all the time when I held this book in my hands, it was gorgeous and shining as if I was staring at a piece of art, not a book. Tell me—has anyone ever believed you when you told them not to worry? This is definitely a Rowling's work; it's funny, charming and full of magic. I got goosebumps since I heard Hedwig's theme and the logo of this movie filled the screen. The first page of this book was very spectacular, too. Let's move to the story. 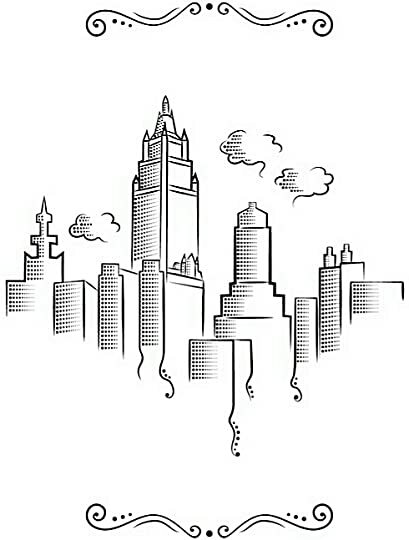 The book started off with the great potential, which gave me the great vibes of old New York. 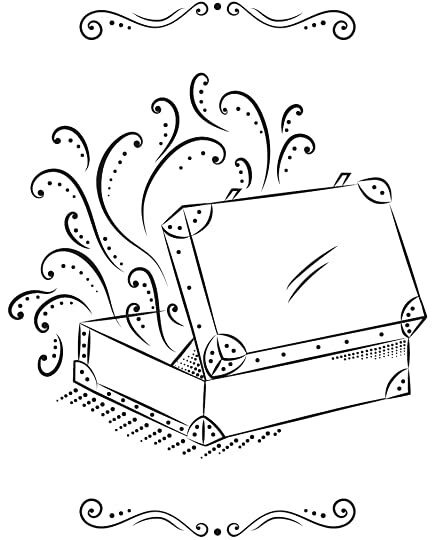 Newt comes to the city for his secret reason, but he lets his magical creatures escape from his case, that's where things get messy. 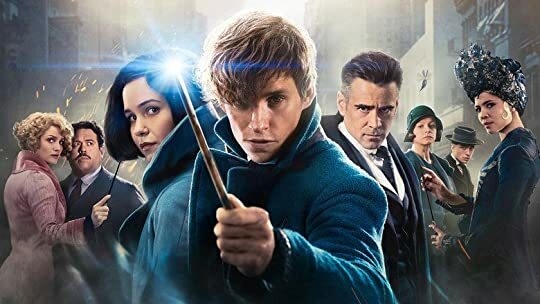 Although everything in Fantastic Beasts didn't cause me to have Harry Potter nostalgia, it still captivated me with the world building and magic system that I was familiar with, such as spells and the differrence between Witches and No-Maj. The political system in this book is intense and mature either. MACUSA in an organisation working as the Minister of Magic in UK and No-Majs stand for Mauggles. I was interested by this side of magic in America. However, Newt is not my favorite character. I'm fond of Credence. His character has a thing to distract me from the hero since I first met him. 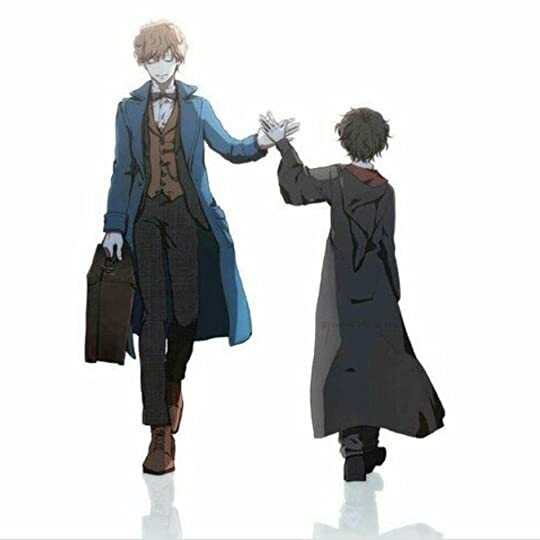 Credence has been punished for all his deeds without reasons and unfortunately, no one loves him and cares for him, that makes him a stoical child. 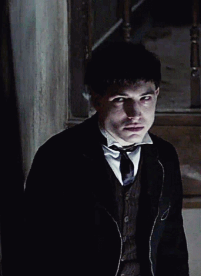 Ezra slayed this role completely, I was astounded by his countenance and the way he gawks at other people, it was so creepy and amazing at the same time. You know. The story is quite slow until the second half. Honesly, I focused on the costumes and soundtrack instead of the story. I think the reason that this happened because the movie couldn't balance two important things, which is the story and the CG, without leaving another thing out. I wasn't excited about those magical creatures, too. I felt kind of so-so for the most part of this movie, maybe it was my false that I expected too much. I mean I liked it but wasn't impressed. This should have been better if Rowling or the producer kept their style as in the Harry Potter series. Those twists. Those plots. Those endings. The narration is kinda straightforward and has nothing to surpirse me, not like HP. I got annoyed so many times by Tina. I didn't like her at all. Her character is boring and not different than annoying heroines from other movies. All in all, both the book and movie are still worth waiting and reading. If you are a big fan of Harry Potter, you can't miss this, no matter what. I don't care that this is just a script, as with The Cursed Child , because I need to know more about this expansive universe. 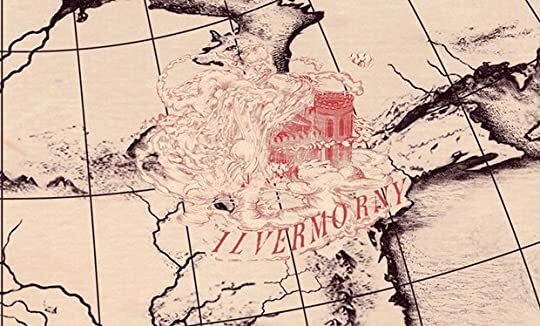 We know so little of the American school, Ilvermorny. 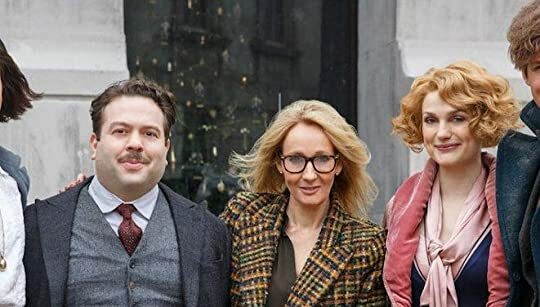 I’m not going to lie…I’m still rather bitter that J.K. Rowling has decided to release only the scripts, rather than taking a little bit more time to develop them into full-length novels, but I guess this assures that nothing shall be cut from the book when the film is made??? Either way, this is one of the attributing factors that has caused J.K. Rowling to take a nosedive down my Favourite Authors list. If Cassandra Clare, Holly Black, and Leigh Bardugo can keep expanding their created worlds, I’m not going to lie…I’m still rather bitter that J.K. Rowling has decided to release only the scripts, rather than taking a little bit more time to develop them into full-length novels, but I guess this assures that nothing shall be cut from the book when the film is made??? Either way, this is one of the attributing factors that has caused J.K. Rowling to take a nosedive down my Favourite Authors list. If Cassandra Clare, Holly Black, and Leigh Bardugo can keep expanding their created worlds, why can’t she? I guess I just don’t love J.K. Rowling as much as I once did anymore. Maybe it’s because I’ve gotten older and have read the works of much better authors, or maybe it’s because of the kinds of things she’s said that makes the news on a regular basis…which have altered my opinion of her. Regardless, I don’t rush to get my hands on anything Harry Potter-related anymore, which as a self-proclaimed Potterhead, breaks my heart. If you could see my room, you’d see Gryffindor merchandise everywhere (YES! GRYFFINDOR AND PROUD!) and an entire bookshelf devoted to special editions of the Harry Potter series that were even imported to add to my collection, along with a number of adorable FunKo Pops. It made me so happy to add a new book to my Harry Potter shelf after SO MANY YEARS (Don’t get me started on the fact that after YEARS of fans asking for it, we STILL don’t have a Marauders’ series in the works, yet J.K. Rowling STILL finds ways to milk the Harry Potter universe by re-releasing the books over and over again, every bloody year). Despite my disappointment at a seemingly random film series, I did end up loving the heck out of this script. But does there really need to be five instalments??? I’m not a fan of Johnny Depp as Grindelwald because I’ve been envisioning the character as an older Jamie Campbell-Bower, who portrayed him in the Harry Potter films…and because it’s been quite some time since Johnny Depp has been in a good movie. I didn’t want his lacklustre performance to affect the overall quality of the Fantastic Beasts film. After seeing the film…yep, my opinion of him hasn’t changed at all LOL. Newt Scamander was an adorable Hufflepuff and I absolutely loved him. Seriously…I would DIE for him. What an absolute cutie. Eddie Redmayne was PERFECT. Don’t get me wrong; he was great in Les Misèrables, but here was where he really shined. 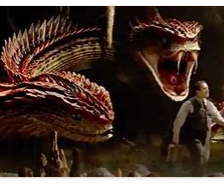 I thought that the main plot was complete and utter FUN as we chased around Manhattan, in search of the escaped creatures who freed themselves from Newt’s case. Newt was such a wonderful caretaker who truly loved his creatures, even humanising them by attaching very human names to them, such as Frank and Dougal. When he was in trouble, Newt’s first concern was his creatures. And when they went missing around the city, he was so worried because they were lost, surrounded by vicious humans, and that’s completely valid. Animals respect other animal species, but humans have always viewed animals as lesser creatures, considering them to be below us, even though dolphins – for example – are a more intelligent species. I also loved seeing the wizarding world through Jacob’s eyes because although we’ve seen Muggleborns in the past, we never really got to know any Muggles (in a positive sense, let’s not count the Dursleys) in the Harry Potter series. His story arc also made me rather sad, because although Jacob was with them, he was never truly one of them, which is how I’ve always felt, since I never received my Hogwarts letter. I felt like I was with Harry, Ron, Hermione, Luna, Ginny, and Neville as I read the books, but I never had the opportunity to take part in the magic. I lived vicariously through them and had to imagine what attending Hogwarts would’ve been like. and the Bowtruckle, Pickett, in particular. I am a HUGE fan of Harry Potter. Even though Harry is not in this story but that doesn't matter because the magic is still beautiful. 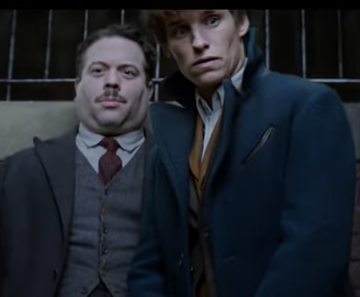 There are great new characters, story, and of course the fantastic beasts themselves! This is a beautifully published hardback on very nice matte paper with wonderful whimsical line drawings throughout the book. The blue and gold embossed dust jacket is a work of art in itself. For anyone who loves books, this book is a keeper. This is a screenplay so don't assume I am a HUGE fan of Harry Potter. Even though Harry is not in this story but that doesn't matter because the magic is still beautiful. 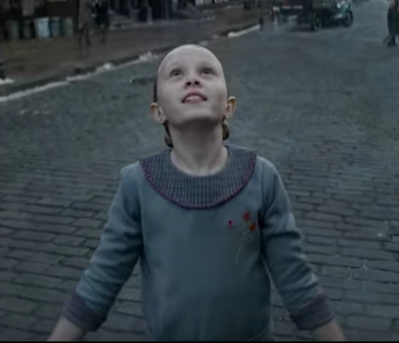 There are great new characters, story, and of course the fantastic beasts themselves! This is a beautifully published hardback on very nice matte paper with wonderful whimsical line drawings throughout the book. The blue and gold embossed dust jacket is a work of art in itself. For anyone who loves books, this book is a keeper. This is a screenplay so don't assume it's a regular novel like the original seven Harry Potter books. I did not read this until after I had seen the movie, so I had the visuals playing in my head as I read, down to Newt's awkwardness and Jacob's wonder. 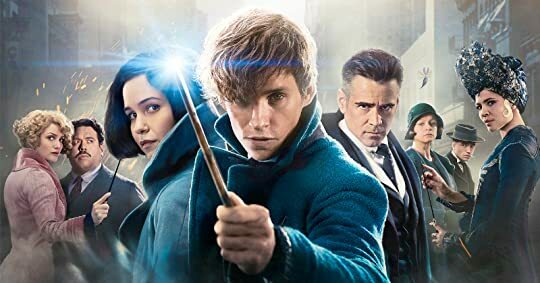 Even without seeing the movie first, this screenplay gives you enough story to be able to appreciate the dangers of this new Wizarding World. J.K. Rowling is a wizard at writing. The story line flows so smoothly and you can picture everything easily in your mind. 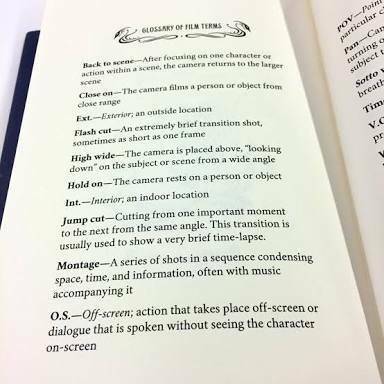 For those that don't know a lot about stage direction, there is a dictionary of the terms they use in the back, but honestly you'll catch on super quick. Everything is very well detailed and the story will have you turning the page for more and more. I also love how it accurately portrays Hufflepuffs. I finished the book in one sitting and enjoyed the ending so much that I wanted to pick it up again and read from start to finish. All the characters were fresh and adorable. All the beasts were indeed fantastic. 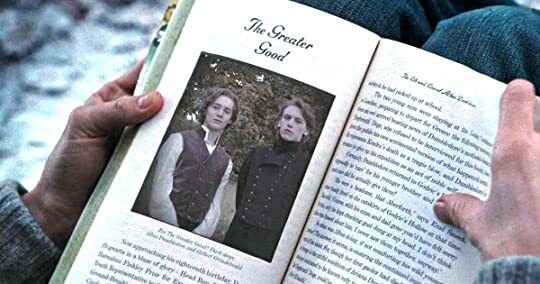 I am impatiently looking forward to learning more about Dumbledore and Grindelwald's past (and about a little secret revealed in this book) in the next movie. Not one bit disappointed. Magical. In every sense of the word. I can't believe I haven't read this yet. A fantastic addition to the Harry Potter universe. 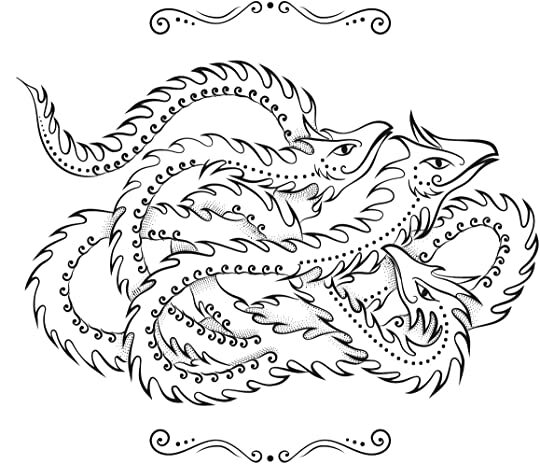 The Fantastic Beasts and Where to Find Them screenplay welcomes you to a new era of magic. 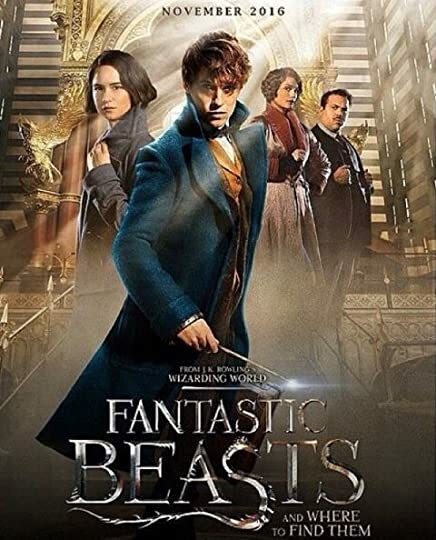 Set in the 1920s at the heart of the wizarding community of New York, J. K. Rowling crafted a refreshing tale with a more mature set of characters yet a lighthearted narrative. Having watched the film first, I can say that it had an amazing cast. In my opinion, the characters were the strongest element of the script. All of them were beautifully written. 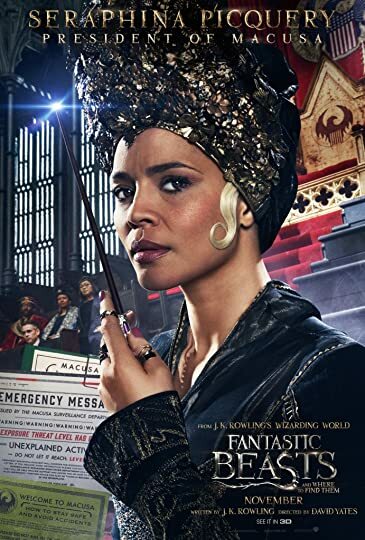 Fro A fantastic addition to the Harry Potter universe. 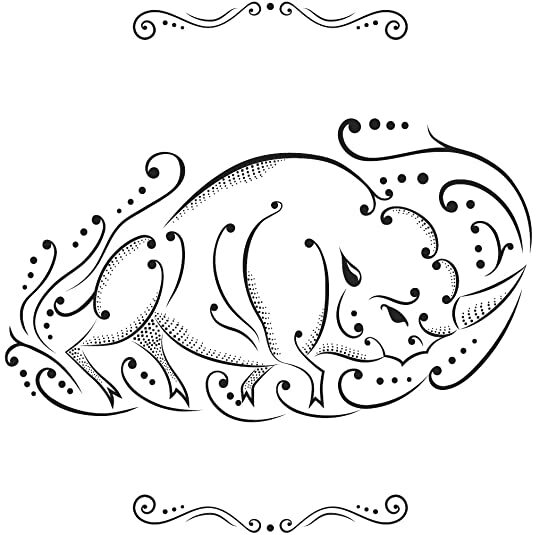 The Fantastic Beasts and Where to Find Them screenplay welcomes you to a new era of magic. Having watched the film first, I can say that it had an amazing cast. In my opinion, the characters were the strongest element of the script. All of them were beautifully written. From our new hero, Newt Scamander, to the lovely sisters, Tina and Queenie Goldstein, and of course to our charming Muggle-er-No-Maj, Jacob Kowalski; everyone was a pleasure to know. 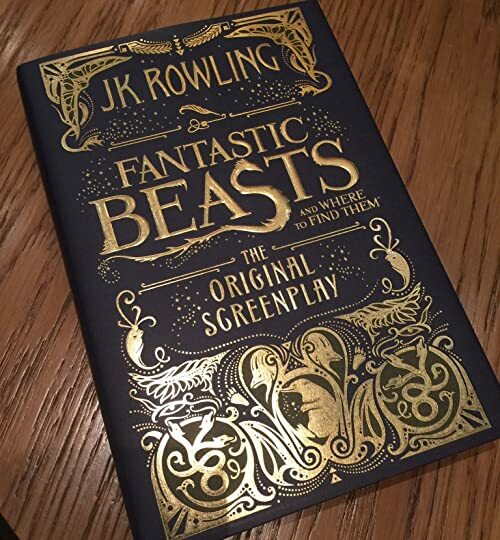 Fantastic Beasts and Where to Find Them is the screenplay for the movie. I couldn't find a single difference from the movie I watched yesterday. It was such a detailed script which invited you to follow the storyline closely. The characters are JK Rowling fantastic and so is the storyline. I don't have much else to say, about the characters or the plot, I'm just so in love with this 1926 spin-off of the Harry Potter world. A definite must read if you love the Harry Potter series. La primera incursión de Rowling en el mundo del guion es cuanto menos satisfactoria. 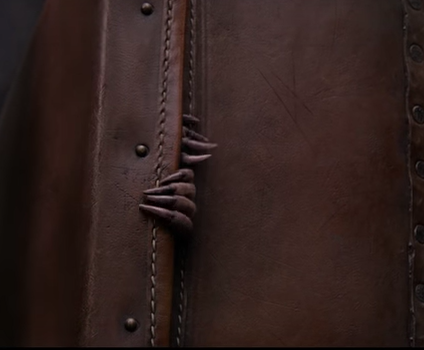 Los detalles aquí plasmados respecto a los plasmados en la película no varían tanto como cabía esperar, pero como fan de Rowling se aprecian otras cosas que quizá es cierto que en el filme no son tan obvias. 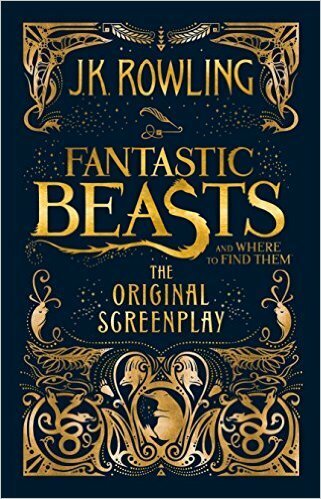 Fantastic Beasts and Where to Find Them: The Original Screenplay es un libro que creo que debe ser el primero de muchos, es decir, que espero que continúen publicando los guiones del resto de películas. Aportan otra visión y es más que interesantes ver sobre lo que se ha trabajado. Como estudiante de comunicación audiovisual me ha parecido un guion sencillo, sin complicaciones más allá de algunas escenas concretas, y los diálogos son perfectos. Rowling no ha necesitado años de trabajo para esto y aunque es su primer trabajo, es brillante tal y como está. Can you IMAGINE being so mind-numbingly in demand that you're offered money to publish a screenplay you were already paid to write, the screenplay for a movie off which you will still profit, a movie which is inspired by a book you already wrote, a book which is actually just a textbook you mentioned in a series that you already completed, a series that has sold hundreds of millions of copies and spawned its own billion-dollar world of movies? There is straight up no reason for JK Rowling to not Can you IMAGINE being so mind-numbingly in demand that you're offered money to publish a screenplay you were already paid to write, the screenplay for a movie off which you will still profit, a movie which is inspired by a book you already wrote, a book which is actually just a textbook you mentioned in a series that you already completed, a series that has sold hundreds of millions of copies and spawned its own billion-dollar world of movies? There is straight up no reason for JK Rowling to not be the richest person in this world. Clearly she doesn't have standards preventing her from publishing anything that will make her money - this book is out in the world, after all. 5 BEAST-SIZED STARS! funny, adorable, thrilling, and unputdownable. A screenplay with rich world building and a gripping, hilarious plot (NOT a novel! The format is very different) written by J.K. Rowling (it's not like the Cursed Child). 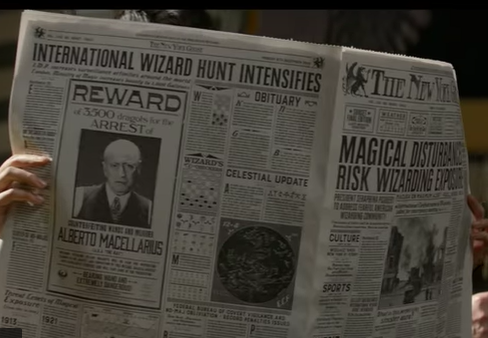 In Fantastic Beasts, we follow the fictional character and author of the original Fantastic Beasts and Where to Find Them, the geeky Newt Scamander, as he looks for magical creatures and gets sucked into 5 BEAST-SIZED STARS! funny, adorable, thrilling, and unputdownable. 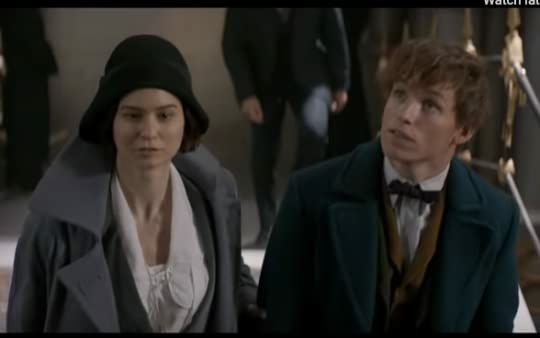 In Fantastic Beasts, we follow the fictional character and author of the original Fantastic Beasts and Where to Find Them, the geeky Newt Scamander, as he looks for magical creatures and gets sucked into a war he'd not really cared to participate in. Tina: Mr. Scamander, do you know anything about the wizarding community in America? Newt: I do know a few things, actually. I know you have rather backwards laws about relations with non-magic people. That you're not meant to befriend them, that you can't marry them, which seems mildly absurd to me. 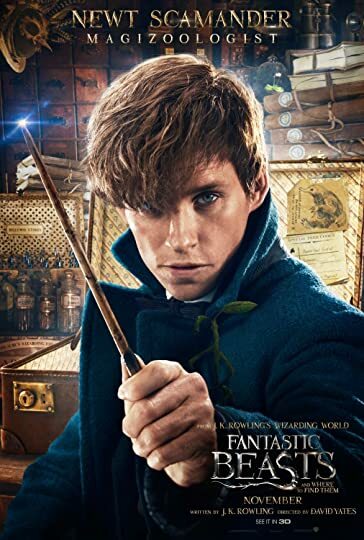 Newt Scamander, magizoologist and aspiring author, has come to America for the book he is writing about understanding the mostly-assumed-dangerous and misunderstood magical creatures which wizards say should be killed. He is carrying a case filled with unimaginable beasts ... when disaster strikes and the creatures are set loose in the city! 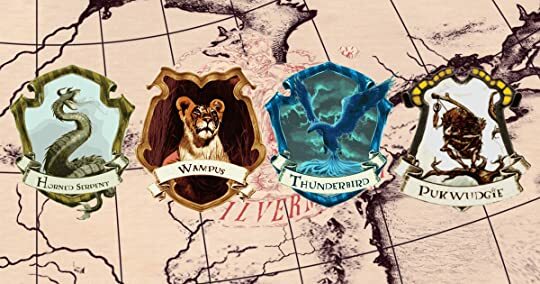 But there are Muggles—no, No-Majs—who call themselves Second Salemers and believe wizards exist, wanting to make the people aware and warn them of these abominations. 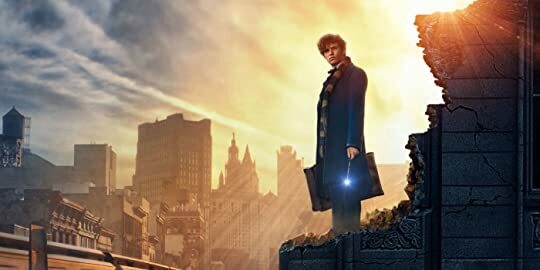 • Newt Scamander: an English wizard, a Magizoologist, and a Hufflepuff, he graduated from Hogwarts and joined the Ministry of Magic, spending two years in the Office for House-Elf Relocation before joining the Beast Division. 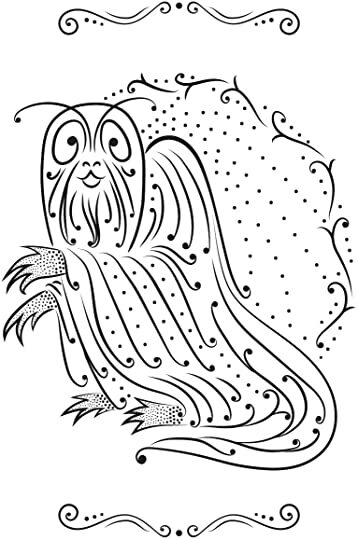 In 1918 he was commissioned by Augustus Worme of Obscurus Books to write Fantastic Beasts and Where to Find Them. Now, in the last stages of writing his book, he finds himself in America for magical-creature-related business. Dedicated, tireless, reasonable, geeky, awkward around people but comfortable with beasts, he is the furthest thing from Harry Potter; though he shares his compassion, special kind of strength, and the tendency to stand up for what's right. Newt made this whole story adorable and gave it a memorable flare :) major props to the lovely Hufflepuffs! 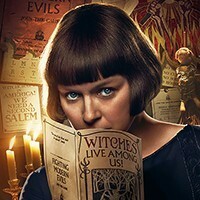 • Porpentina Esther “Tina” Goldstein: a half-blooded American witch who graduated from Ilvermony (the American school of witchcraft and wizardry, where she was sorted into the Thunderbird house) and works for the Magical Congress of the United States of America (MACUSA) as an auror. Practical, level-headed, and grounded, she's very soulful, courageous, ambitious, and has a desire to stand up for what is right. I love these about her! 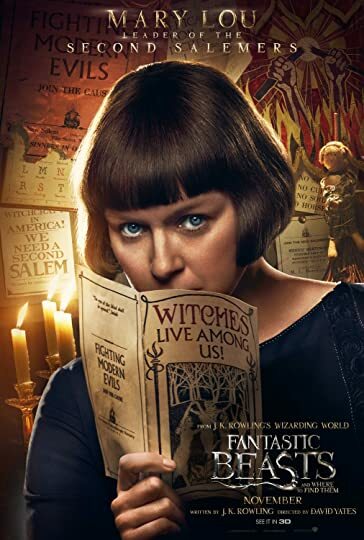 • Queenie Goldstein: an accomplished Legilimens—someone with the ability to extract feelings and memories from another’s mind—and a half-blood American witch, she attended Ilvermorny School of Witchcraft and Wizardry, where she was sorted into Pukwudgie house. She has desk job in the Wand Permit Office, within the Magical Congress of the United States of America. Jacob: Newt...I don't think I'm dreaming. Newt (vaguely amused): What gave it away? Jacob: I ain't got the brains to make this up. They were probably my favourite thing about this installment, and they make me really wish this had been a novel—because we could've explored their characteristics more thoroughly! 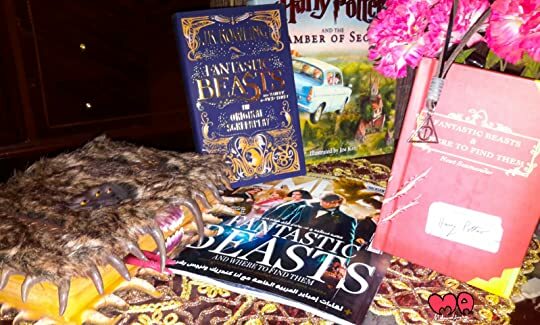 Though, there's still the original Fantastic Beasts and Where to Find Them which can help you! 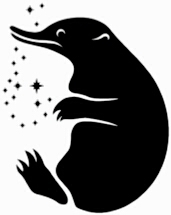 A list of the ones included: Niffler (I want one! ), House Elf, Occamy (incredible), Murtlap, Billywig, Swooping Evil (the best! ), Thunderbird (glorious), Giant Dung Beetles (hilarious while in the background rolling dung), Graphorns, Fwooper, Bowtruckle (I need one!! please! ), Nundu (wow), Doxy, Glow Bug, Grindylow, Diricrawl, Mooncalf (oh man, I love this one so much I just wanna eat it—nooo, that sounds horrible. I don't actually wanna eat it, it's so cute I wanna squeez it—wait, no, let's just say I'd like to tenderly hug it and then kindly pat it...), Mirmite (mesmerising), Obscurus (dark and intriguing), Erumpent (its mating dance was my undoing! ), Goblin, Giant, Ashwinder Egg, and Demiguise (my adorable whitebeard). Casting & Acting: Just imagine what a hard thing it is to play in a movie that's got a magical creature in every other scene, and not just there as decoration but for you to constantly interact with—including feeding, patting, chastising, talking to, chasing, or even doing mating dance to! You have to look at a stick—or nothing—and just imagine a creature that doesn't even exist really and one you've never met or will meet. Every bit of imagination will be squeezed out of the actor at the end of the day, leaving an exhausted shell—so, well done! The acting was just impressive. Eddie Redmayne (Newt Scamander) was the perfect guy for the job! He was practically glowing in this adaptation. I have long been a fan and loved that man :) I couldn't be happier that he's been cast, and nor can I imagine anyone else as Newt. Katherine Waterston (Tina Goldstein), however, a little disappointed me in the acting part and I didn't feel satisfied. I'm still not sure about the choice. Dan Fogler (Jacob Kowalski) was spectacular. Like, wow! Diving onto the cute confused but enthusiastic Muggle thrown into the Wizarding World without a blink. I enjoyed every single one of his scenes, amd it was a good thing he was usually there! 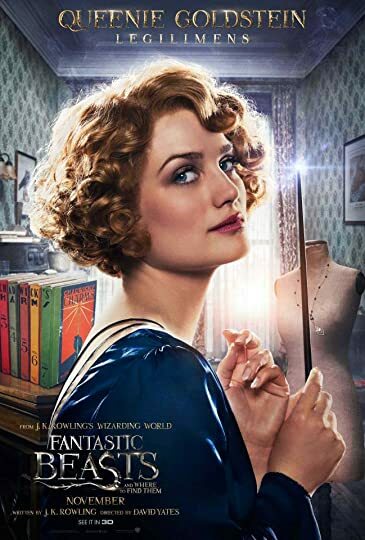 Alison Sudol (Queenie Goldstein) was another amazing one. Hilarious and flirty and weird, she performed the best Queenie I could hope for! FIRST OF ALL! CAN SOMEONE TELL ME HOW CAN I TRAVEL THROUGH TIME AND MARRY NEWT SCAMANDER??? And he has the most wonderful creatures! 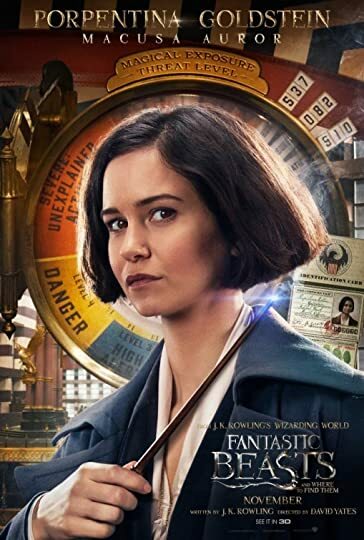 I spent 50% of the movie declaring my love for Newt; 15% swooning over his fantastic beasts; 15% saying this movie was perfection; 15% praising J.K Rowling -I love her so much!! !- and the last 15% was all me fangirling over Queenie. She's my hero. That was 110%. oops. Sorry! By the end of the movie, I was Pickett, the Bowt FIRST OF ALL! CAN SOMEONE TELL ME HOW CAN I TRAVEL THROUGH TIME AND MARRY NEWT SCAMANDER??? 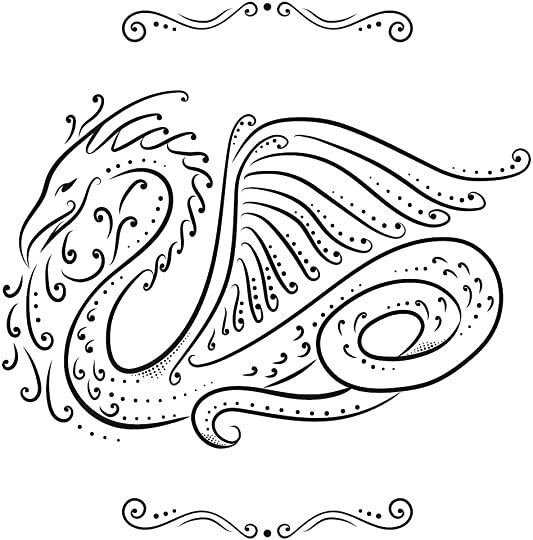 Por una parte amé la edición que saco salamandra, tapa dura, cada página con detalles que van desde ilustraciones hasta la tipografía. 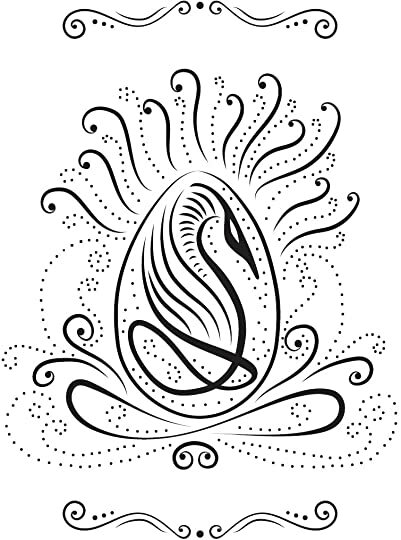 Lo que no me gusta,y aclaro es una queja por detalles que he visto en librerias mexicanas es el incremento brutal de precio que últimamente tienen los libros no sólo de Salamandra, lo he notado en varias, sin embargo Salamandra se está saltando la barda con lo absurdo de subir de $20 hasta casi $100 a las ediciones de Harry Potter, y si parece más una critica soci Por una parte amé la edición que saco salamandra, tapa dura, cada página con detalles que van desde ilustraciones hasta la tipografía. Es recomendable que hayan visto la pelicula para que entiendan mejor el libro, ya que al ser guión muchos detalles se dan por hecho que los conoces. shout out to J.K. Rowling for murdering me ever since the age of six, i really appreciate it, plz never stop. I practiced the Book Before Movie Policy in my approach to this beautiful screenplay. Why? Because there's just something about the feeling of seeing words come to life before your very eyes. I plan to watch the movie as soon as it's legally released online. I had never really cared about the magical creatures in Harry Potter, so I'm glad to say that reading this screenplay made me have a paradigm shift. 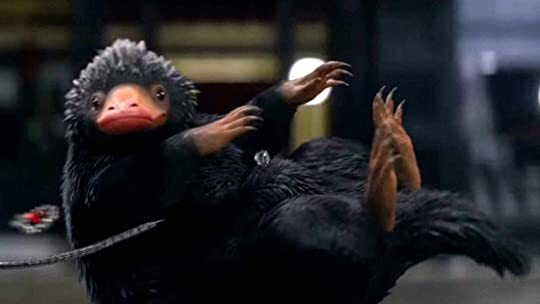 Although I haven't seen them on screen, I already have my favorite fantastic beasts: the Niffler, the Swooping Evil, and the Thunderbird. 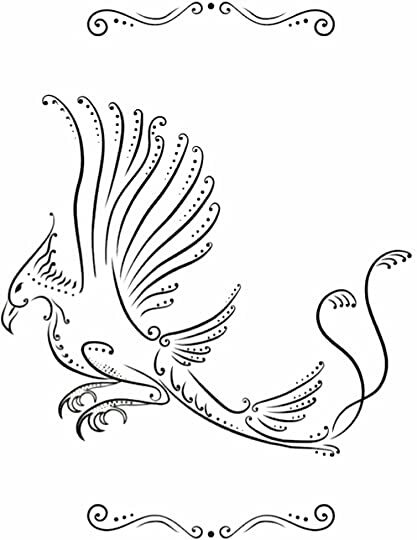 I probably liked the Thunderbird the most because I was sorted (via Pottermore) into its own Ilvermorny House. I'm definitely coming from a Pokemon fan's POV when I say that I would love to own a Thunderbird in real life. Hmm...it would logically be weak against rock or ice-type beasts. LOL. In contrast to Cursed Child, Fantastic Beasts didn't have any infuriating characters. I particularly found Newt to be very charming because of his careless, shrewd, and affectionate demeanor. As for Tina, I was quite annoyed with her at the beginning, but she eventually gained my respect. Er, I don't want to talk about Jacob and Queenie because just thinking about their relationship makes me sad. Rest assured, I did like them a lot. Plot-wise, Fantastic Beasts was highly refreshing and entertaining. It actually contained two/three plot twists, which made me very happy. The ending was bittersweet, but I loved it nonetheless. It's a good thing I have four more screenplays to look forward to. I admit that the franchise somehow reeks of capitalism. However, I really don't care because the Wizarding World never gets old! I absolutely loved this book!!! It was amazing and it was the perfect way to get another taste of the wizarding world. I don’t even know where to start. This book is based in the 1920s which is many many years before the time of Harry Potter. It was also based in America! Both these things gave us an insight into how everything was many years before and in a different country. The entire storyline was perfect and I wish that it was a proper book with more detail. I watched the movie before the b I absolutely loved this book!!! It was amazing and it was the perfect way to get another taste of the wizarding world. I don’t even know where to start. This book is based in the 1920s which is many many years before the time of Harry Potter. It was also based in America! Both these things gave us an insight into how everything was many years before and in a different country. The entire storyline was perfect and I wish that it was a proper book with more detail. I watched the movie before the book and to be honest I recommend you do that. They are exactly the same but reading a script makes it very hard to visualize everything but because I watched the movie first I could picture everything so vividly. It felt like I was watching the movie all over again. I don’t particularly like reading scripts mainly because of what I said before but this script was quite descriptive. Originally I wasn’t going to watch the movie first but it kind of just happened and I don’t regret it. 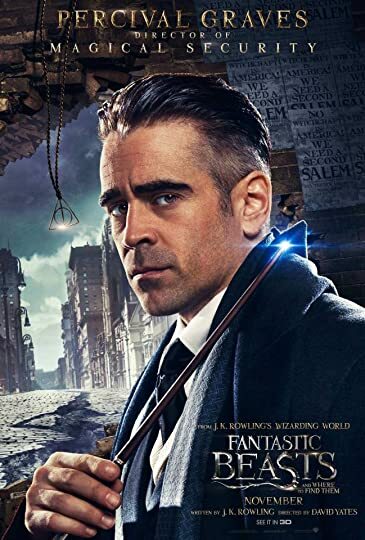 This screenplay for the film "Fantastic Beasts and Where to Find Them" (a prequel to the Harry Potter books) is humorous and entertaining. 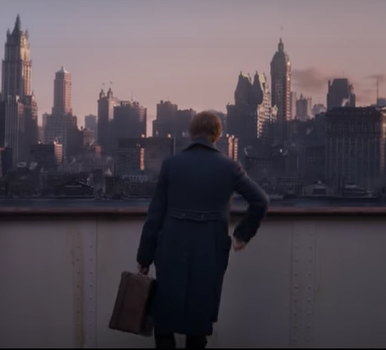 The story: It's 1926 and Newt Scamander, a magizoologist, arrives in New York City with a case full of magical creatures. Inadvertently, Newt steps into a sea of trouble. 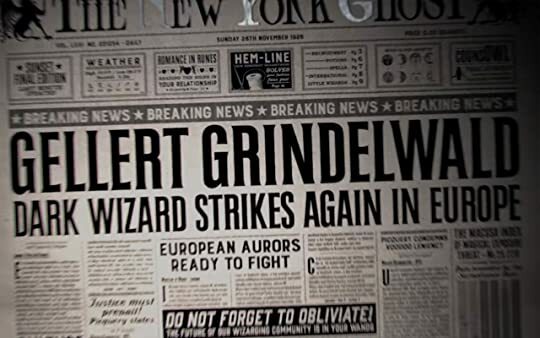 The notorious dark wizard Gellert Grindelwald has been causing havoc all over the world, raising fears that 'no-mags' (muggles) will learn there are witches and wizards in their midst. 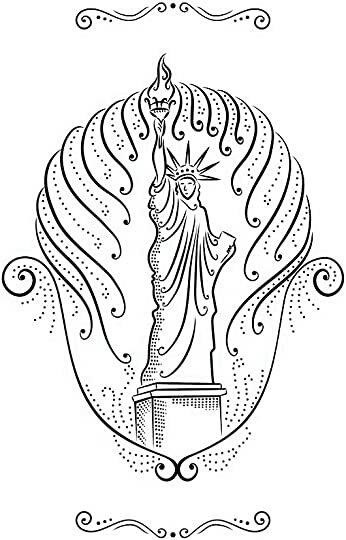 Thus New York based MACUSA (Magical Congress of the United States of America)* is working day and night to keep magical occurrences below the radar. To this end, Tina Goldstein (a demoted Auror) is scouring the city for sorcerous miscreants. 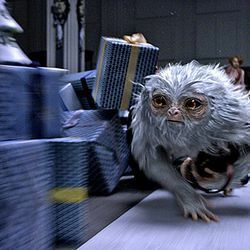 Several creatures escape from Newt's case and his 'Niffler' goes on a spree, stealing shiny objects and gold coins all over the place. 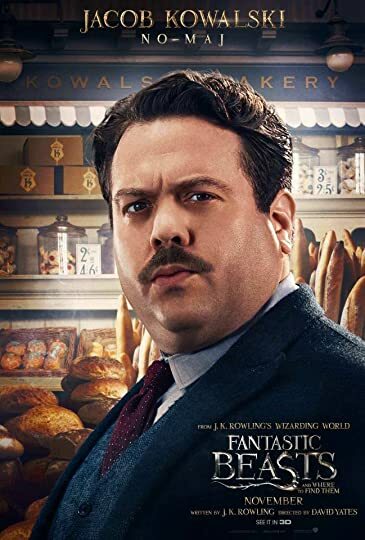 While trying to catch the Niffler, Newt accidentally exchanges cases with Jacob Kowalski - a no-mag, would-be bakery shop owner - who's drawn into Newt's hijinks. Meanwhile, no-mag 'preacher' Mary Lou Barebone is sure there are witches and wizards around, and wants to expose and exterminate them. To this end she founds an organization called the 'New Salem Philanthropic Society' and proceeds to makes speeches and hold demonstrations around the city. Add a mysterious black whirlwind that's destroying parts of New York and killing people.....and all the elements are in place for an exciting magical adventure. 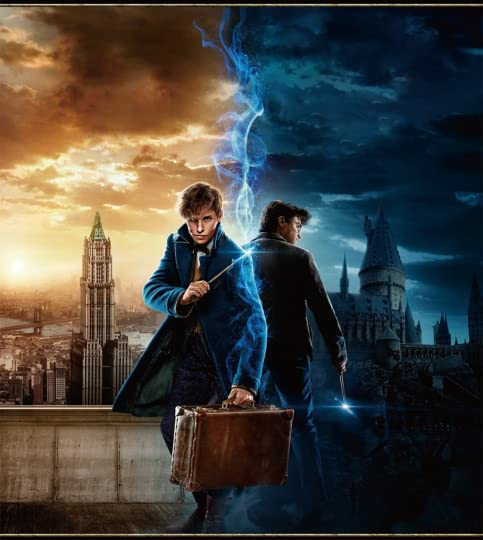 Other interesting characters in the story include: Newt's array of supernatural creatures. Tina Goldstein's sister Queenie - who's a legilimens (mind reader). Mary Lou Barebone's three adopted children, Credence, Chastity, and Modesty - who (supposedly) help with her witch-eradication campaign. 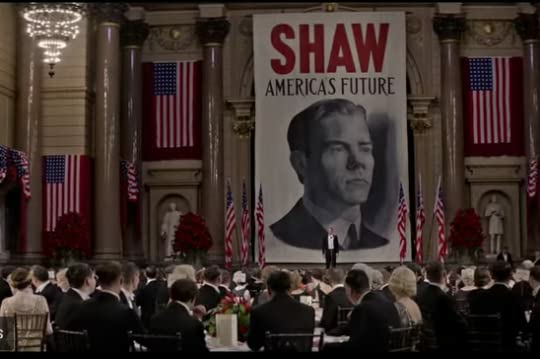 Langdon Shaw, who's seen supernatural things and wants to tell the world; Langdon's brother, Senator Henry Shaw - a politically ambitious man who wants Langdon to go away and shut up; and more. I'm a big fan of Harry Potter and I completely enjoyed this screenplay. Highly recommended to fans of the boy wizard. *The term MACUSA (which I assume is a take-off on Yakusa) really cracked me up. Just like the film, only better in some parts. “Jacob: Newt . . . I don't think I'm dreaming. Newt: What gave it away?